The Clay Trails are a series of scenic routes for walking, cycling and horseriding that opened in March 2005 in order to try to open up this fascinating landscape to the general public. This is China Clay country where china clay (kaolin) has been extracted for aver 300 years, a process that has literally shaped the lanscape. There are pits, that have become blue / green coloured lakes and spoil heaps, now overgrown and forming the 'Cornish Alps'. The trails vary in difficulty, although most are surfaced with gravel and accessible via wheelchair or mobility scooter. 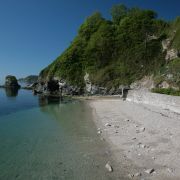 The Pentewan Trail, around 2.5 miles (4km), follows a former railway that opened in 1830 in order to transport clay, tim and coal from the pits to the quay at Pentewan Harbour. When the harbour silted up in 1916 the railway, which first used horses and then steam trains, ceased to operate. The trail begins in a village called London Apprentice, near Mevagissey, and ends at the silted-up harbour, now home to swans and other birds. 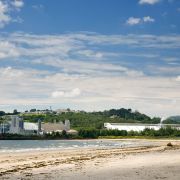 The Green Corridor is an easy walk with a gentle slope that opened in March 2006 in order to connect St Austell with the Wheal Martyn trails. Around 3.5 km long, the trail, which starts in Tremena Gardens in St Austell and ends at the China Clay Country Park, takes in abandoned clay driers and impressively tall brick chimneys that would have been used for drying the clay. The Wheal Martyn Trail is somewhat harder and may cause problems for wheelchairs. 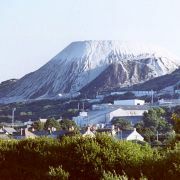 Starting in the China Clay Country Park car park, this is an extraordinary trail that encompasses some of the best and clearest views of working clay mines. The trail cuts through areas of rock, grass and heather and passes close to working mines and pits that have filled with water to become startling luminous green pools. The trail is around 5 miles (8km) long. The Bugle to Eden Trail is much easier and shorter, at 4 miles (6km). The trail starts in the old mining town of Bugle and ends at the Eden Project. It takes in pretty countryside, seome woodland and the open countryside towards Bodelva. 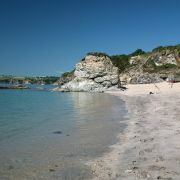 The St Blazey Trail runs from the town of St Blazey to Par Beach, a distance of around 3 miles (5km). The trail takes in the changing scenery as it leaves the scarred industrial landcsape of tips and pits and makes its way to the coast, where tall clay-drying chimneys still belch out huge clouds of white steam. 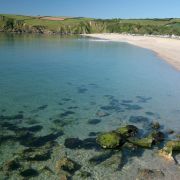 For further information and to download a map visit the Cornwall's Clay Trails website or download the Clay Trails leaflet.